Sam calls me from time to time … sometimes twice a day, sometimes more. But, I have talked to him. Sam says he’s from Microsoft Windows and that he has been monitoring my computer and that I am uploading malicious things. He must mean these blog posts. But, he’s a tenacious fellow and just keeps calling. 2) There is no #2. Orioles Manager Buck Showalter can call after 10 p.m. You can’t. Tommy Hunter For The Save! Usually, we just let the phone ring when we see that it’s Sam. The other day, though, I decided I would talk to him again. I wanted to ask Sam why he had a job whose main description is, best I can tell, to take advantage of, and steal from, innocent people. I thought it would be interesting to ask a crook why he was crooking. I figured I could reason with Sam. My tough love question would pierce his heart. There would be an uncomfortably long pause as Sam thought deeply about what I had said. Then Sam, seeing the error of his ways, would thank me for setting him right. He would leave his job of cheating and hurting people and set off on a new course of helping people. You may think I’m making this up for the sake of this post. I assure you, I am the idiot you think I am. I really believed this would happen. This could not go wrong. I did my part just right. Then I waited for the long and remorseful pause from Sam. And, this is when he started yelling at me. Sam was yelling about my computer doing malicious things. And, my Windows ID number that he had, but that I did not. He started yelling a long string of random numbers and letters. This was crazy talk. Sam was ruining everything. I told him I was going to hang up. (I’m exceedingly polite at times.) “Sam. I am hanging up now.” And, I did. I’m sort of sad about Sam, but I know that he is so far up in the crooking business that it would take more than one person to pull him out. I’m also mad at Sam for being a crook and for ruining my plan and ruining this post. Sam called again the other day. But, I didn’t take his call. My heart just wasn’t in it. All I can do is ask you this. If some day soon you get a call from a U.S. Cellular number somewhere in Maine, it might be Sam. Please tell him “hi” for me. Maybe you can reason with him. This entry was posted in Life and tagged Buck Showalter, bullpens, scammers, Tommy Hunter by Jackie, The Baseball Bloggess. Bookmark the permalink. Jackie Howell, I love you for this. 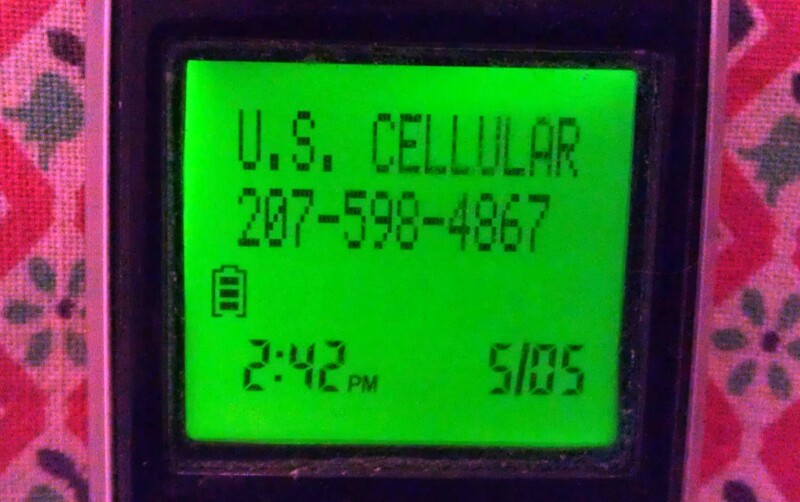 U.S. Cellular? Irritatingly persistent? Yelling loudly? I think “Sam” might be Ken “Hawk” Harrelson. You know, you might be right! It was that kind of yelling that doesn’t have any pauses for breath … or any pauses that you can interrupt into. Which is pretty much how one would describe Hawk Harrelson! Sam has changed his name, but not his tune. He now goes by Ken and calls me from time to time. He even gave me a number to call him back when I once told him I didn’t have time to talk — that line was always busy:):) Why are we so polite to crooks? By the way, my cut off time for phone calls is 9:00 pm. Clearly I don’t watch night games. Thanks for another great read! I haven’t had a call from Sam since I posted this … maybe I have finally set him on the road to redemption. Hoping the best for your “Ken” too! Editor/Husband’s at-the-ready for the phone call from Buck … until then, I am the lucky recipient of the “earful”. Has Buck picked up the frequency of his phone calls for bullpen counsel? And how does Buck feel about J. Schoop, the O’s young second basemen’s prospects for a strong 2015? As for Jonathan Schoop … the Orioles are exceedingly high on him. The skinny is that everyone believes that Schoop will be the Manny Machado of second base and that they are content to let him work through the poor at-bats, base-running mistakes and defensive errors that are usually worked through in the minors, because his overall value (and potential) outweighs his rookie mistakes. When he is great, he IS Machado great. And, when he makes a mistake, he’s a little like a puppy — you get angry at first, but then you see how young and earnest he is, and you let it slide. Cal Ripken stopped by the broadcast booth a few months ago and admitted he hadn’t been keeping up with the Orioles … the first (and, really, only) question he had: “How good is Schoop?” and Mike Bordick said, without missing a beat, “Schoopy Good!” which has become a catch phrase in our house.